Anyone who owns a knife knows, how frustrating it can be when the knife just isn’t clean. 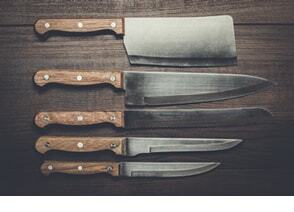 Spotted or rusty knives can ruin any knife set and make cutting anything a real pain. Let’s make one thing clear: A rusted butcher knife won’t be cutting anything. So it’s important to know what type of steps you can take to maintain a healthy standard of cleanliness for your blades. If you do not know how to clean a knife, this is extremely important for you, as dirty or damaged knives can lead to severe inconvenience (or at least cause you to spend big money purchasing a new set). Following the tips below can help you keep your knives looking their best! When it comes to cleaning knives, there is no better advice than what I am about to tell you: The best clean starts with a proper knife care. 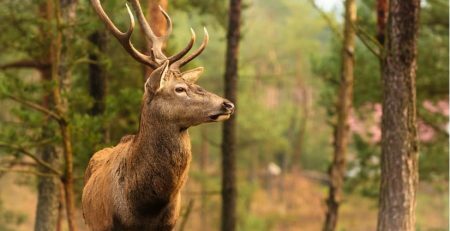 Knife maintenance is as much important as the proper clean so before we get into the nitty-gritty details of explaining, how to clean your knives, let’s start with a list of daily steps you can take to ensure you have the cleanest and most presentable knives you can possibly hope to have. This primarily concerns your butcher knives and other kitchen knives that go through daily wear-and-tear. So, how to treat them right? You should never put your knives in dishwasher. You should never put your knives in the dishwasher. There are some exceptions, but in general, leaving your knives in dishwasher allows excess amounts of water to cause severe damage to your blades, especially in the form of rust. Many people are confused to find their knives spotted after just one wash, but it’s not uncommon. Your blades weren’t designed to be thrashed with large volumes of hot water for long periods of time. Instead (carefully) hand-wash your knives. Cleaning knife blades is very simple, but you must do it correctly in order to avoid damage. This starts at the most simplest of levels, namely: don’t let chunks of fat, meat or any other kind of dirt sit on your knife blades for too long. For example, if you have just finished using your butcher knife, don’t just throw it in the sink and wait for later. Before it hardens, rinse the dirt residue off the blade immediately and, perhaps even more importantly, dry the blade afterward. 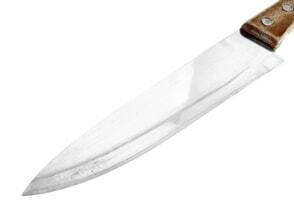 Letting your knife rest under stagnant water can cause premature rusting. When it comes time to clean your blade (remember: you only rinsed it before), do so gently with a sponge or dish towel. With the blade pointed away to avoid injury, slowly use your sponge or cloth to clean the blade with warm soapy water. If you’re really unfamiliar with how to clean knives, you can take an even simpler approach. Simply lay your knife flat on the counter and scrub it with your cloth or sponge.Once you deem it sufficiently clean, turn it over so that the side you just washed is resting on the counter, and the dirty side is facing the ceiling. Repeat the washing process, rinse with warm water, and then thoroughly dry your knife so that there is no remaining water. It’s been said before, but it warrants a reiteration: stagnant water leads your knife blades to rust. Cleaning knife handles requires considerably less care than cleaning knife blades. Many of us use butcher knives that have wooden handles. Though it might be common knowledge that water is damaging to wood, that doesn’t stop a large amount of people from “over-washing” their wooden-handled knives (some put them in the dishwasher and you know how bad that is). Make sure not to leave your wooden-handled knife out to dry, and don’t leave it in a place where it’s around too much moisture. The wood on the handle will soak up all the excess water and cause the handle to swell. This could even lead to cracking of the handle. You can fix a rusty blade, but there’s not much you can do to fix a cracked handle (at least not aesthetically, anyway). Long story short, make sure you treat the bottom of your knife with the same amount of dignity as the top of your knife. Your knife works as a unit, so it’s important not to be reckless with any part of it. You can clean your rusted knife. If you are someone who uses a slightly rusty knife, never fear: there is still hope for you! If your blades are facing minimal rust, you can use a household lubricant such as WD-40 to remove the rust. So this is my guide, how to remove rust from knives. 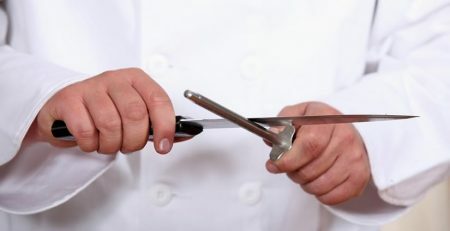 Note that this technique also works for pocket knives and is very simple, even for someone who does not know how to clean a blade. 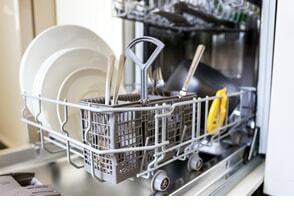 To do this, use a sponge and simply apply the WD-40 to the rusted blade and scrub away. You want to use enough force to remove the rust, but not so much that you’re just eating away at your blade. Once you have applied the coat of WD-40 to your knife, you should notice a much more distinct shine. In fact, it should be as good as new! If not, your knife may be experiencing a more severe rust problem, so stick around because we will get to that later. Another great thing you can do is to frequently spray your knife with oil. This will keep your knife fresh and prevent it from sticking. Applying such oils to your knife will help keep it fresh and clean. You don’t need to oil your knife too often just make sure it maintains its shine and doesn’t stick. The basic idea is that if you spray the oil every-now-and then into the pivotal area of the blade. 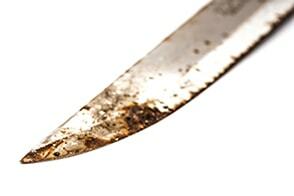 Knives that are left open are more susceptible to the element, and thus they face considerable more rust damage. You will be able to find the best knife oil that I use, very soon on my website. As you can see, knife cleaning is not complicated process, however it require from you to keep to a few simple rules and if you can do that you will be able to keep your cutting tool in a great shape! You can also clean old and rusted knives. As you’d imagine, the process to remove rust from knives is similar as cleaning a newer knives from the rust, but it’s going to take more than just a little WD-40 to solve this problem. It’s time to bring out the big guns. Now, don’t worry. We won’t actually need a firearm, but we will use the next best thing—acid. Get ready to put your goggles on because we’re going full mad scientist. Just kidding, but in order to get that deepest rust off your knives, you will need a combination of citric acid powder and warm water. Just make sure you don’t lock yourself away and do it in the garage—or you really will look like a mad scientist. Take your citric acid powder and dump it in a solution of warm water. Once this is done, simply let your knives rest in the water solution for around two hours. 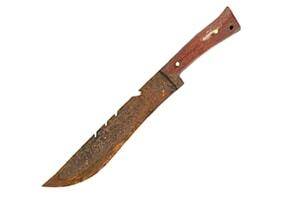 The acid will eat away at all the caked-on rust, naturally cleaning your knife. After around two hours have passed, go back to your solution and extract your knives. Don’t panic if you still notice patches of rust on your blades. This is perfectly normal. In order to combat the remaining rust, take either a course sponge or some fine steel wool and scrub away at your knife. This will leave you with a nearly clean knife blade. Depending on the texture of the rust, you may have to soak your blades again. If so, repeat the process, and you should be good to go. For those of you who are a little more studious, you can even sand your blade after you have completed the aforementioned process. Starting at 320, run along the length of the blade until it’s as good as new. You now have the basics down-pat, and you are pretty much good to go! But before you go off in your quest for cleaning a knife, let me provide you with a few final tips. If any of your knife blades come into contact with any foreign sources you are not sure of (let’s say, for instance, saltwater), rinse and dry them immediately. It may not seem like your blade will be too effected (especially if it’s stainless steel), but don’t be deceived. Not every knife is created equally, and sometimes these external substances that appear benign can actually cause great damage to your knife. Simply wiping your blade off after each use (even if you don’t suspect it to be that dirty) can be of great assistance to you. Remember: the small steps you take now add up and could save you a lot of trouble later! So there you have it, folks. These “how to clean a knife” tips will help you keep your blades performing and looking their best. Now, you are no longer able to use the excuse that you do not know how to clean a knife — so I hope your knives stay as good as new! 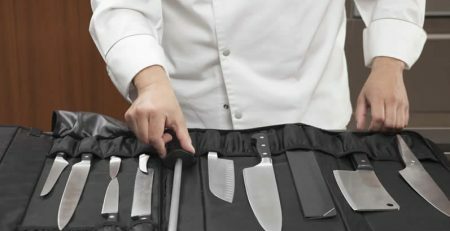 This doesn’t mean that you need to go around the house collecting all your old knives and polishing them until they shine, but it does give you the necessary information to make sure you don’t waste money buying new knife sets every few years. From butcher knives to pocket-knives, these tips will greatly reduce the amount of dirt and rust that can settle on blades over time. And while it may seem like a chore at first, I’m sure that once you start, you will find that you quite like cleaning your blades. I actually follow all your tips 🙂 I have German knives that were a bit spendy, so I tend to take care of them. I assumed that if a knif got rusty it was mostly because either it is made of a cheap metal or it sat in water for a long period of time. I have in a rush, put the smaller knives of the set in the dishwasher. I will remember to do what I normally do, wash them by hand! Thanks for sharing! I’m wondering about how you recommend “drying” the wooden handles – you write that it’s bad for them, and not to hang them out to dry, but what is your best way to care for them so they don’t rot or crack? There is two main types of wooden handles – natural and laminated. 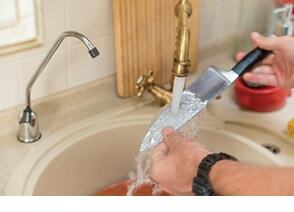 Laminated handles will not soak the water as quickly as the natural ones. That’s why it’s important to dry the handle quickly and not to wait until it dry itself. I’m usually doing it by simply having a dry cloth and wiping the handle. The water will not be soaked if you do it straight after the wash, which makes much easier to remove the water from the handle.